Just a quick note to let you know the longlist for this year’s Miles Franklin Award has been announced. I’ll leave discussion of it to others, but it includes both big names like Thomas Keneally and Peter Temple and debut books from writers such as Deborah Forster (for The Book of Emmett) and Patrick Allington (Figurehead). And, as always, there are surprising omissions: just off my head I would have thought Steven Amsterdam’s Things We Didn’t See Coming and Kalinda Ashton’s The Danger Game were shoo-ins for the longlist at least, and while I’ve not read it I’m interested (especially given the reviews it’s received) Cate Kennedy’s The World Beneath didn’t make the cut. Interesting also that the definition of “portraying Australian life in any of its phases”, which has so bedevilled the Award in the past, is now elastic enough to include Peter Carey’s “American” novel, Parrot and Olivier in America, a book that, while one might make an argument seeks to explore the differing origins of the Australian and American minds, is really only Australian in the sense that one of the narrators was, for a time, a convict. Congratulations to all the longlisted writers. a list of wonderful writers – established and new. I too wondered about the Australian facet of life requirement – not only Carey, but Tom Kennealy and Alex Miller are novels set outside Australia and outside this requirement. who can we voice dissatisfaction too – only partly joking. Actually, quite a lot of the very wonderful Lovesong (Alex Miller) takes place in Australia, and two out of the three lead characters are Australian. The People’s Train (Keneally) moves in and out of Brisbane. How very gracious of you. I think you should have been there too, but I wasn’t a judge, so I don’t get a say. Will check out the Emmett. Dott — the terms of the prize as they appear in Franklin’s will don’t actually say anything about an Australian setting as such. As James says, it depends entirely on how you interpret Franklin’s phrase ‘Australian life in many of its phases’. Considering that Franklin herself spent more than 25 years of her life overseas, I think she probably would have thought that travelling and living abroad was one of the phases of Australian life. 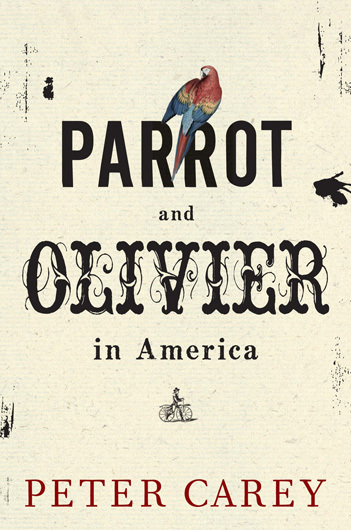 I haven’t read Parrot and Olivier in America but I know James has reviewed it and am happy to take his word for the tenuousness (is that a word?) of the Australian connection. A much stronger case could be made for Jack Maggs, my favourite Carey novel, which I think is indeed a former Miles F winner. The will doesn’t even say anything about the winner having to be an Australian writer. If DH Lawrence had published Kangaroo after 1955 then presumably it would have been eligible, though some might argue it’s not of ‘the highest literary merit’, which is the only other criterion for winning the prize. The book doesn’t even have to be a novel; the will says that if no novel is submitted that the judges think is good enough, they may award the prize to a play instead, though I don’t think it’s ever happened. if you want to voice dissatisfaction, and why not, all you need to do is Google ‘Miles Franklin Literary Award’ and the results will contain a link to a company called Trust, who are the administrators of the award and who have links to its home page as well as their own contact details. Unfortunately my copy of the Carey’s in storage, so I can’t look at it to refresh my memory, but if my recollection’s correct the Australian material is pretty incidental, and feels pretty tacked on. I suppose one of the things the book is doing is trying to illustrate the different circumstances under which the Australian mind and the American mind evolved, but it’s certainly not a dominant (or to be honest even particularly integral) part of the book. That said, I’m actually happy to see the judges taking a flexible attitude to the terms. The narrow interpretations of the past have been intensely problematic, and done the award no favours in the public mind. And while I’m not someone who thinks the Australian phase of life term should be thrown out (it was her money, so she gets to set the rules) I do think our notions of Australianness are now broad enough to admit all sorts of things. But simultaneously, “phase” does seem to imply a representation of Australianness in some form (which gets the Carey in, by a nose) and rule out books such as (say) Paul Morgan’s ancient Roman novel, The Pelagius Book, or Delia Falconer’s Civil War book, The Lost Thoughts of Soldiers. I’d also argue, as you do, that the nationality of the author isn’t relevant. But you don’t have to go back to Lawrence to find an author who isn’t Australian winning it – I could be wrong but I’m reasonably certain Shirley Hazzard (who won for The Great Fire) isn’t an Australian citizen anymore. Though if memory serves you were a judge that year, weren’t you? Thanks Kerryn – that did clarify it – and yes, The Book of Emmett did indeed slip beneath the radar, as did Glenda Guest’s Siddon Rock – a book i revelled in and read twice through immediately. It is certainly correct that an author’s nationality has nothing to do with consideraton for this award. The British novelist, Matthew Neale, was shortlisted for the award in 2001 for his novel ENGLISH PASSENGERS. As far as I can determine, the first non-Australian to be selected. Nor, I should add, is it a requirement that a work need be a novel. Again in 2001, Hannie Rayson’s play LIFE AFTER GEORGE was shortlisted. Still the only play to make it so far. I hope the current judges didn’t look at the Amsterdam book as being a collection of short stories and deemed it ineligible due to not being a “published novel or play” as per the conditions of the award. For about three minutes, yes. Unfortunately I actually had to sign a declaration at the outset that I wouldn’t publicly discuss the proceedings — what happens on tour stays on tour, etc. But I can’t remember any discussion about Australian citizenship, and given that all my fellow-judges had been through the process at least once before, I think if it were an issue it would have at least been mentioned. Oh, so it was that year. James, thank you for mentioning my book. It is frustrating to be ruled out of contention, but I do think a bequest is a bequest. Just a shame it’s our most prestigious and internationally-watched award. It’s persnickety of me, when you’re being generous, to jump up and down about this point. But it’s the Indian Wars, not the Civil War! The one where thousands of indigenous people were killed, and fought valiant guerilla campaigns against their dispossession, not Americans fighting each other. I know this was probably just a typo, but it really bothers me — and bothered me throughout the Australian reviewing process — when these two very significantly different battles are mixed up. Especially when I have very little interest in the Civil War, and the continuing modern obsession with it. Whoops. And not a typo, I’m afraid, but carelessness on my part (though for the record I do understand the distinction). Now there’s a very interesting possibility, given the elasticity of the Franklin phrase. It occurs to me that a book about the killing of indigenous people in the colonial era could well be regarded as within the limits of that ‘Australian life’ criterion, given that is in the nature of fiction to produce meaning via metaphor, analogy and allegory (which in turn feeds into that very interesting discussion about authenticity and the ‘real world’ in fiction, something I’ve been forced to think about a lot of late myself — most recently this morning as I reviewed a pretty terrible “novel” about Alice Liddell, purportedly narrated by Alice herself but peppered with contemporary Americanisms and unconsciously used pop-culture tags including ‘I couldn’t help but wonder’ and — wait for it — ‘We’ll always have Wonderland!’). But I digress. I think an argument could be made, however Jesuitically, for The Lost Thoughts of Soldiers as eligible — in the sense that it’s a phase of Australian life to have had, to remember, to think about and to imagine such a familiar moment in history and nation-building. And by the same token, if Michelle de Kretser’s publishers had submitted The Hamilton Case — set almost entirely in Ceylon-as-was and containing no Australian characters but directly and urgently addressing many matters of colonial and postcolonial cause and effect — for the 2004 MF award, I would as a judge have made the same argument in a Quixotic attempt to have that novel win the prize instead of Hazzard’s The Great Fire. If that is not telling tales out of school. Oh Kerryn, it certainly would have been great if that interpretation had won the day – but I do think it’s a stretch! I have had the thought for a while that one thing the Miles could do is have some kind of ‘salon de refusé’ — a list of honourable mentions of books that would have been on the shortlist, had content not made them ineligible (a little bird did tell me this was the case with my book. I would have been very pleased to see that said in print, if it was so). But I’m thinking that the judges try to do something like this when they commended Grand Days, and it backfired, with the threat of legal action etc? Still, I think it would be one way of giving the Miles more authority as a national prize, especially as more and more Australian writers are going to set novels off-shore (or even off-planet, or off-history) – because having a wider sense of the world, and seeing ourselves as players in it, with authority to write about it even without Australian characters or setting, is, I would argue, also very “Australian”. Thought something looked wrong. “Salon des refusés” works better, I think. It’s certainly promising to have novels on the longlist that perhaps challenge rigid notions of distinctions between literary genres such as Temple’s terrific crime novel, and both Hartnett and Silvey’s ‘crossover’ young adult/adult novels. I am pleased that there is less angst about rewarding excellent books that might once have been pigeonholed as “only” (!) crime or young adult books. And “Butterfly” is incredibly innovative in its treatment of point of view. I haven’t read the Allington (will get myself to Readings this week). Presumably, this means that books like the deliciously dark and intelligent “The Virtuoso” and Hornung’s “Dog Boy” can’t be considered…. And there are some debuts on the longlist. Kalinda – I agree with you about ‘Emmett’ (and with James about The Danger Game’). Interesting – one of the two pivotal characters in the excellent ‘The Virtuoso’ was Australian, and in fact a reimagining of a real-life Australian composer, Noel Mewton-Wood. I would have thought that would make it at least as eligible as the Peter Carey, based on James’s assessment of how the Carey fit the criteria of the prize. There are some great books on this longlist, including Patrick Allington’s debut, among others. But I do think it missed a few obvious women contenders: Cate Kennedy’s The World Beneath, Kalinda’s The Danger Game, Andrea Goldsmith’s Reunion – and, now that you point it out, The Virtuoso. Well, that was enough to get Shirley Hazzard over the line in 2004. But it’s all down to the discretion of the judges in any given year — and that’s provided that the book was submitted for the prize at all, which it may not have been. Re Hazzard — having a handful of Australian characters was enough, I mean, not writing about Noel Mewton-Wood!